Scientists say they have created the first transistor from a single phosphorous atom using near-atomic precision, which could keep development of processors on track with Moore's law until at least 2020 and offers the possibility of a general-purpose quantum computer that processes data significantly faster than current devices. 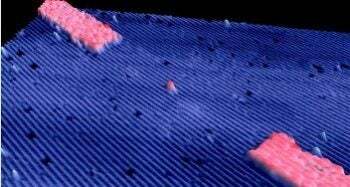 To create the transistor, scientists at the University of New South Wales, Australia used a scanning tunneling microscope (STM) to manipulate atoms on the surface of a crystal inside an ultra-high vacuum chamber. The newly created transistor was then covered with a non-reactive layer of hydrogen and encased in silicon. Tiny atom-sized transistors have been created before, but were often built by chance, according to the researchers. “This is the first time anyone has shown control of a single atom in a substrate with this level of precise accuracy," says Professor Michelle Simmons, a group leader and director of the ARC Centre for Quantum Computation and Communication Technology at the University of New South Wales. Moore's law, first postulated by Intel co-founder Gordon Moore, says the number of transistors -- the main component of a microchip -- that can fit on a chip doubles about every 24 months. To keep pace with Moore's law, transistors would have to reach the atomic level by 2020. It's not clear how long it will take to turn the researchers' early work in atomic transistors into a usable model for manufacturing. One current problem with the atom-sized transistor is that it operates at extremely cold "liquid helium temperatures," according to the scientists' work published in the journal Nature Nanotechnology. The boiling point for liquid helium hovers around negative 450 degrees Fahrenheit. Single-atom transistors could also herald the age of quantum computers, devices that would be significantly faster and smaller than computers today. Instead of using binary bits that have two states (1 and 0), quantum computers use quantum bits or qubits that can exist simultaneously as both a 1 and 0. The practical benefit means that a quantum transistor could perform multiple operations at once, instead of a single operation at a time, as current transistors do. Some scientists doubt that a general purpose quantum computer is even possible owing to the odd behavior of quantum particles. Before this newest discovery, the most recent single atom transistor success came in 2009 from researchers in Finland and the University of New South Wales. The Australian physics department has been at the forefront of nano technology in recent years. In 2010, the university created a transistor using quantum dots that was ten times smaller than traditional transistors used in current computer chips.